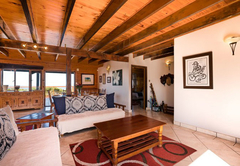 Kleinkrantz Holiday House is a property providing self catering in Wilderness for up to 12 guests visiting the Garden Route region. 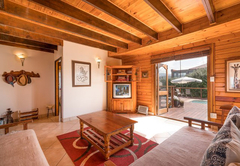 Situated a stones throw away from the beach, in the village of Kleinkrantz, Wilderness. 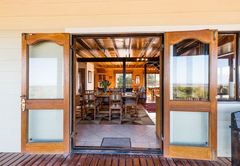 Kleinkrantz Holiday House offers comfortable Garden Route accommodation for up to 12 guests. This is a child and pet (animal) friendly holiday home. 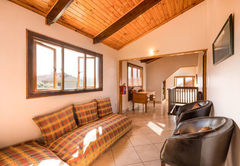 Kleinkrantz Holiday House is a self catering holiday home furnished with five bedrooms and four bathrooms. 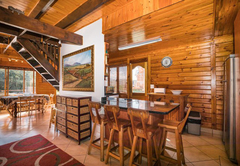 Three bedrooms are located upstairs and two are downstairs. 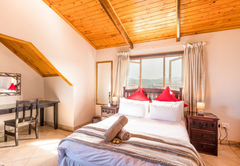 The main bedroom has a double bed with an en-suite bathroom and boasts views of the sea and mountains. The second bedroom has a double bed and an en-suite bathroom with a shower. 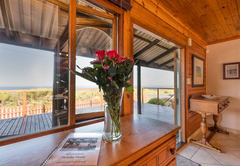 The third bedroom boasts views of the sea and has a double bed with an en-suite bathroom with a corner bath and shower head. The other bedrooms either have a double bed or two single beds and share an inter-leading bathroom. There is an open plan living area with two dining tables that seat up to 10 guests in total. 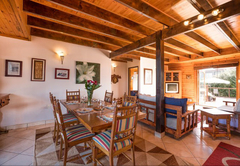 There is a fully equipped kitchen with everything needed for self catering. It consists of a double door fridge / freezer, stove, oven, microwave, coffee machine, dishwasher and a washing machine. 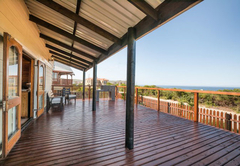 Outside there is a sea facing deck with outdoor furniture and a fully enclosed garden. There is also an outdoor shower. 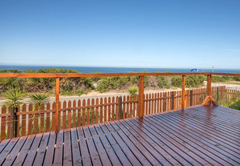 This double-storey Garden Route Beachfront Holiday Home offers five bedrooms sleeping up to 12 people in comfort and style. Upstairs are three double rooms sea facing, all en-suite; downstairs is one double garden facing and one 4-sleeper room sea facing sharing an inter leading bathroom. 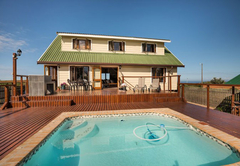 Enjoy both sea and mountain views from this well positioned property. 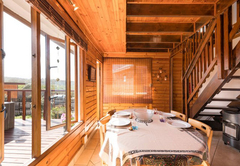 There is an open plan living area with two dining tables that seat up to 10 guests in total. There is a fully equipped kitchen with everything needed for self catering.